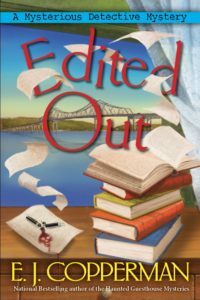 Mystery author Rachel Goldman is getting used to the idea that her fictional creation Duffy Madison has somehow taken flesh-and-blood form and is investigating missing person cases not far from where Rachel lives. Wait. No. She’s not getting used to it at all, and the presence of this real-life Duffy is making her current manuscript—what’s the word?—lousy. Rachel Goldman writes mysteries in which Duffy Madison, consultant to the county prosecutor’s office, helps find missing persons. Rachel is busy working on her next book, when a man calls out of the blue asking for help in a missing persons case. The caller’s name? Duffy Madison. Is this real or has she lost her mind? She doesn’t have much time to find out because a serial killer is on the loose, kidnapping and murdering mystery authors. And Rachel may just be the next target. 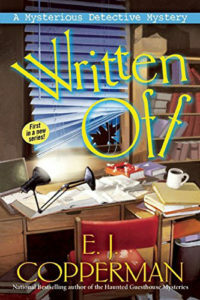 Full of uncanny intrigue and witty humor, E.J. Copperman’s imaginative series debut Written Off is sure to be a new fan favorite for readers of Donna Andrews.